Dragon Boat racing is an ancient Chinese Ceremony that symbolizes the human’s struggle with nature and the fight against deadly enemies. For Breast Cancer survivors, this symbolism is a poignant reminder of the struggle against the cruelly random nature of breast cancer and the fight to control the disease. As a result of of medical study in Vancouver in 1996, dragon boat teams for breast cancer survivors now exist worldwide. 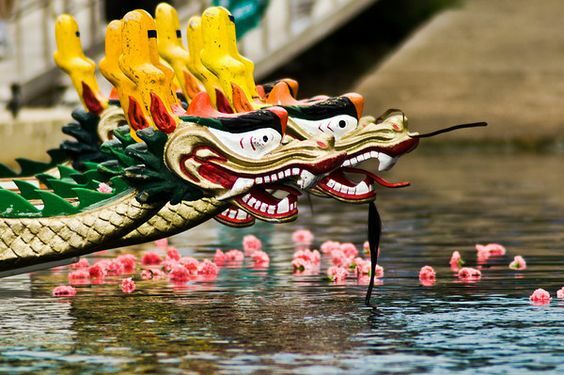 The first breast cancer dragon boat was organized in Vancouver, British Columbia. Abreast in a Boat began as a research project headed by Dr. Don McKenzie, a sports medicine physician at the University of British Columbia. The conventional wisdom of the day was that those who had experienced breast cancer should not to participate in activities that involved strenuous use of the muscles in the upper body. This advice was given because of the risk of developing lymphedema after surgery or radiation. Although there was no scientific evidence to indicate that exercising was the cause, there was and is no cure for the condition when it occurs. Dr. McKenzie wanted to enable women to resume active lifestyles, free from the worry of developing this painful and disfiguring condition. He devised a program to see if it was possible. Dragon boat racing was chosen because it involves vigorous upper body exercise. The Abreast in a Boat project showed that those who participated did not have an increased incidence of lymphedema. In fact, many patients with lymphedema experienced relief from doing the very physical exercise they had been counselled not to do. Over two decades later even greater health benefits are being demonstrated such as general overall improved health, reduced risk of primary breast cancer and reduced risk of breast cancer recurrence. In 1996, at the conclusion of the original research project, everyone involved wanted to continue. So, not only did the Vancouver team continue, it began to spread its influence throughout Canada, the USA, Australia, and now into Asia and Europe and South America. In Winnipeg, Breast Cancer Action Manitoba, along with other members of the local breast cancer community, were inspired to organize a local team. After contacts with the Vancouver team, the Chemo Savvy Breast Cancer Dragon Boat Team began its organizational process in the fall of 1997. In March of 1998, members began a weekly workout at the Downtown YM-YWCA to prepare for Winnipeg's dragon boat festival in August. Many of the women on the team had little previous experience with a fitness regimen, but everyone was up to the challenge. Competing in their first dragon boat festival, the crew paddled two heats and though their race times were less than notable, they won the team's first trophy for being the "most inspirational". Chemo Savvy is a thriving dragon boat team, but we are more than just that. As an active member of the International Breast Cancer Paddlers Commission (IBCPC), Chemo Savvy participates in shaping the sport for breast cancer survivors around the world. 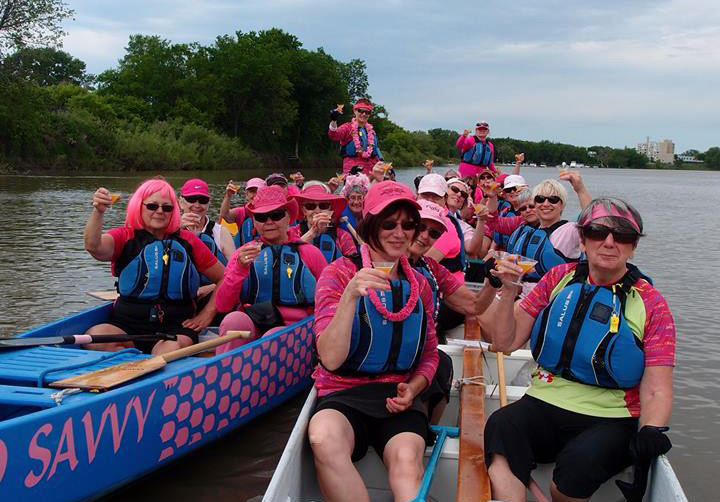 In addition to extensive travels annually to paddling events across Canada and into the U.S., Chemo Savvy has competed in the International Breast Cancer Dragon Boat Regattas in Caloundra Australia, Peterborough Ontario, Sarasota, Florida, and competed in the fifth International Breast Cancer Dragon Boat Regatta in Florence, Italy, in July of 2018. Off the water, Chemo Savvy participates in various events aimed at promoting fitness and good health choices for everyone as a means of reducing cancer risks. We can be seen at fundraising events for various cancer agencies, participating in community events such as the Santa Claus Parade, holding public information displays and talking to the media about issues related to breast cancer, survivorship and partnering in the quest for a cure. Most importantly Chemo Savvy is a fantastic support network of breast cancer survivors, for breast cancer survivors. Read more about us, or if you’re a breast cancer survivor, maybe you want to join us!